Please click here for preparations of doming. Doming adds 3D effect on 2D sticker surface and creates impressive appearance. Doming is applicable on small trimmed stickers. 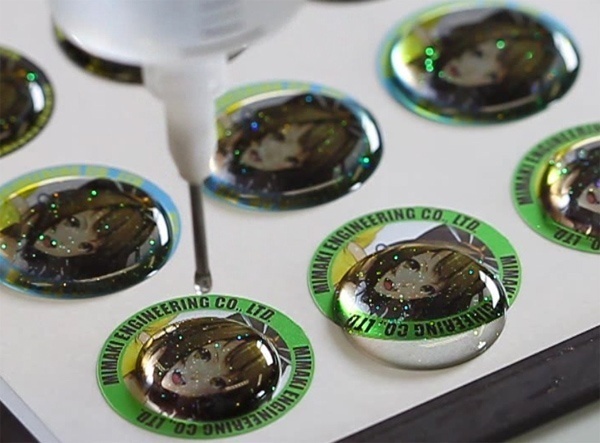 The surface tension of liquid resin keeps itself on the sticker surface. Cover the surface with the resin with a small brush or rubber spatula. If air bubbles are found, warm the resin to remove them with a gas torch. Place the case in a dry chamber and leave it overnight. Place the case in a dry chamber and keep it horizontally. After one hour, check the surface of case whether air bubbles are arisen.